Wanna invest like Jay-Z? Then it's time to put your money where your mouth is ... the chicken wing business! TMZ has learned Jay-Z -- along with his mother Gloria and sister Andrea -- secretly invested in a buffalo wing joint in Brooklyn called Buffalo Boss. It's not just because wings are delicious -- Jay's first cousin Jamar White is one of the owners. The joint is already making a positive impact in the community -- recently rewarding outstanding students at a local middle school with FREE FOOD! How awesome is that?! Forget the mic ... pass the blue cheese! \n\n\nWanna invest like Jay-Z? 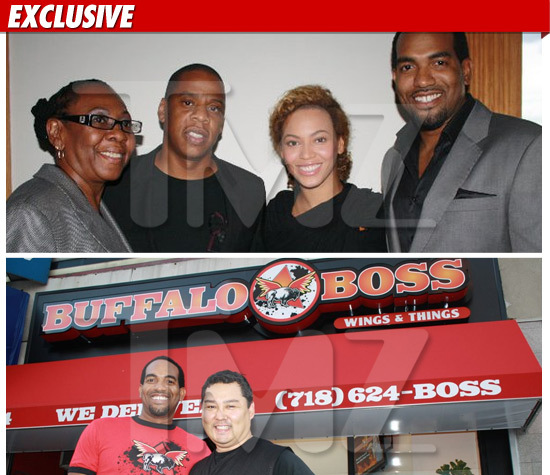 Then it's time to put your money where your mouth is ... the chicken wing business!\n TMZ has learned Jay-Z -- along with his mother Gloria and sister Andrea -- secretly invested in a buffalo wing joint in Brooklyn called Buffalo Boss.\nIt's not just because wings are delicious -- Jay's first cousin Jamar White is one of the owners.\nThe joint is already making a positive impact in the community -- recently rewarding outstanding students at a local middle school with FREE FOOD! How awesome is that? !\nForget the mic ... pass the blue cheese!